Everything Beautiful Began After [Book Review] – my books. my life. Rebecca, George, and Henry have all left their home countries to find refuge in Athens, a city full of lonely people. Their lives become endlessly entwined, forcing them to reflect on their complicated pasts and changing their lives forever. Simon Van Booy is a literary genius. This book is just as amazing as you hope it will be. Go read it now. Simon Van Booy IS a literary genius. He is probably my biggest literary crush at the moment. I adored Love Begins in Winter (I recently described it as “the closest thing to perfect a short story collection can be”). I had some concern that Van Booy’s talent might not translate from short story to novel. But that concern was completely unnecessary. This book IS just as amazing as you hope it will be. Interestingly, I started reading this book on my last day in Athens. The city plays a large role in the book (it’s almost like another character). The timing was completely coincidental but I couldn’t be happier that Athens was fresh in my memory as I read. I really didn’t see the path this book was going to take. I don’t want to give anything away because the lack of information meant that the story just ripped my heart out and caused more than a few tears, smiles, and sighs. Everything Beautiful Began After is beautifully told. During the course of a normal book, I might highlight 5 passages. Maybe. I highlighted 15. Every sentence is lovely. Van Booy doesn’t miss a beat. Keep your eye out for my Best of 2011 list in January. Because I’m pretty sure this will be on it. Go read it now. *Page numbers may differ in the final edition. I remember I really liked The secret lives of people in love and Love begins in winter, even though I’m not a short-story person. I totally agree about how beautifully he writes. Will definitely be checking this out. 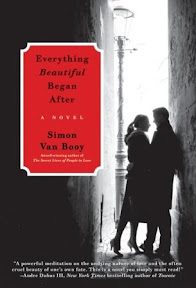 I reviewed Love Begins in Winter, and have to agree that Van Booy is something special. I love the way he gilds all his sentences with such emotion and meaning, and now I am going to have to read this book. It sounds excellent, and I can’t wait!! Great review on this one! i’m really looking forward to this one and i’m so glad that you loved it. i skimmed your review for now, but will come back and read it more carefully once i’ve finished the book. How perfect to start reading this while in Athens! It sounds wonderful. I’m now #1 on the hold list at the library, so hopefully I’ll be able to read it soon! Yea! Someone else who read and loved this. I reviewed it week before last and just loved it. The last half was just gut wrenching but so so perfect. Glad you enjoyed it as much as I did. I had the chance to get this from the publisher and turned them down; you totally made me regret that choice. I must remedy this as soon as possible. Thanks for a great review! Wow great review!! I keep forgetting what this book is about but thank you for the reminder because now I’m super excited to read this!! And I have a copy so that excites me too Lol. Did you catch how I’ve been raving about the audio, read by the author with the intoxicating British accent, on Twitter? If not, I think you need to do a re-read, er, listen?